We’re enjoying the increased daylight here in Chippenham! We hope you are too, wherever you are in the world. It was a full but encouraging term between Christmas and Easter, with lots of great opportunities for both Mike and Peter to preach, travel, and connect with Christians around the UK and Europe. We’re very grateful to God for Cor Deo. It’s a privilege to be part of a ministry that, from the beginning, aims to multiply believers after God’s heart. We try the best we can to reflect our God who is a “spreading goodness” (Richard Sibbes). As supporters and friends you are a key part of this ministry – thank you! Join the mentors for a week-long exposure to Cor Deo training. Starting on Tuesday and ending Friday, we will have four days of intensive study and fellowship together in Chippenham, starting each day in John’s Gospel. 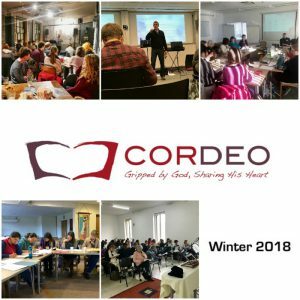 This opportunity is ideal for those who would like to get a taste of Cor Deo’s ministry, whatever their context. There are still a few places available. It’s a great chance to come even if you’ve been to an Intensive before. Perhaps you can invite a friend? Email here for information or to register your interest. Some advance notice for you… On Friday October 19th – Saturday October 20thwe will have a mini-Intensive here in Chippenham. More details to follow soon, but get it in your diaries!